DNS, or the Domain Name System, translates human readable domain names (for example, www.amazon.com) to machine readable IP addresses (for example, 192.0.2.44). All computers on the Internet, from your smart phone or laptop to the servers that serve content for massive retail websites, find and communicate with one another by using numbers. These numbers are known as IP addresses. When you open a web browser and go to a website, you don't have to remember and enter a long number. Instead, you can enter a domain name like example.com and still end up in the right place. A DNS service such as Amazon Route 53 is a globally distributed service that translates human readable names like www.example.com into the numeric IP addresses like 192.0.2.1 that computers use to connect to each other. The Internet’s DNS system works much like a phone book by managing the mapping between names and numbers. DNS servers translate requests for names into IP addresses, controlling which server an end user will reach when they type a domain name into their web browser. These requests are called queries. Authoritative DNS: An authoritative DNS service provides an update mechanism that developers use to manage their public DNS names. It then answers DNS queries, translating domain names into IP address so computers can communicate with each other. Authoritative DNS has the final authority over a domain and is responsible for providing answers to recursive DNS servers with the IP address information. Amazon Route 53 is an authoritative DNS system. Recursive DNS: Clients typically do not make queries directly to authoritative DNS services. Instead, they generally connect to another type of DNS service known a resolver, or a recursive DNS service. A recursive DNS service acts like a hotel concierge: while it doesn't own any DNS records, it acts as an intermediary who can get the DNS information on your behalf. If a recursive DNS has the DNS reference cached, or stored for a period of time, then it answers the DNS query by providing the source or IP information. If not, it passes the query to one or more authoritative DNS servers to find the information. Please note that Amazon Route 53 is not currently available on the AWS Free Tier. How Does DNS Route Traffic To Your Web Application? The following diagram gives an overview of how recursive and authoritative DNS services work together to route an end user to your website or application. A user opens a web browser, enters www.example.com in the address bar, and presses Enter. The request for www.example.com is routed to a DNS resolver, which is typically managed by the user's Internet service provider (ISP), such as a cable Internet provider, a DSL broadband provider, or a corporate network. The DNS resolver for the ISP forwards the request for www.example.com to a DNS root name server. The DNS resolver for the ISP forwards the request for www.example.com again, this time to one of the TLD name servers for .com domains. The name server for .com domains responds to the request with the names of the four Amazon Route 53 name servers that are associated with the example.com domain. The DNS resolver for the ISP chooses an Amazon Route 53 name server and forwards the request for www.example.com to that name server. 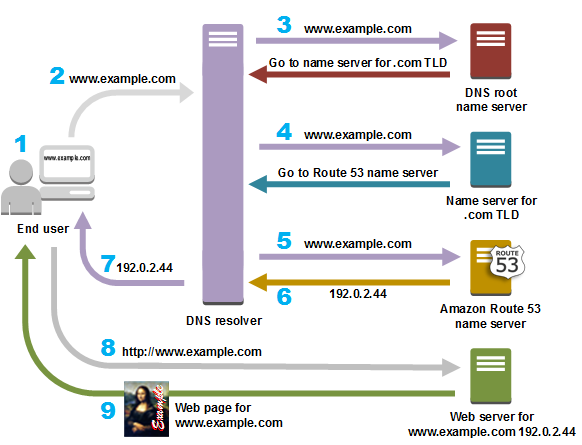 The Amazon Route 53 name server looks in the example.com hosted zone for the www.example.com record, gets the associated value, such as the IP address for a web server, 192.0.2.44, and returns the IP address to the DNS resolver. The DNS resolver for the ISP finally has the IP address that the user needs. The resolver returns that value to the web browser. The DNS resolver also caches (stores) the IP address for example.com for an amount of time that you specify so that it can respond more quickly the next time someone browses to example.com. For more information, see time to live (TTL). The web browser sends a request for www.example.com to the IP address that it got from the DNS resolver. This is where your content is, for example, a web server running on an Amazon EC2 instance or an Amazon S3 bucket that's configured as a website endpoint. The web server or other resource at 192.0.2.44 returns the web page for www.example.com to the web browser, and the web browser displays the page.